Entrance to the middle temple. Three temples make up this extraordinary temple complex – located not that far from the cliff top. 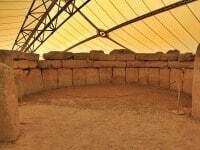 The earliest of the three temples is a relatively simple one, built about 5,600 years ago. The second one, the South Temple constructed about 5,000 years ago, is aligned with the rising sun at the equinoxes and solstices. The last of the temples, the so-called Middle Temple, was built on an artificial platform sandwiched in between the earlier two temples sometime between 5,000 and 4,500 years ago. Given the presence of remains beyond these temples, it is thought they are just a part of a much larger ritual centre. 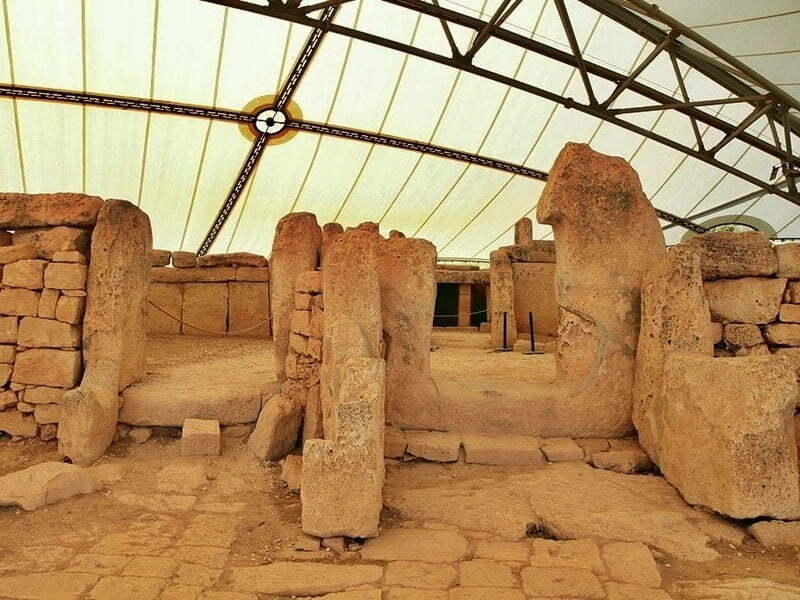 Although the Mnajdra temples are relatively well preserved, the structure was weathering badly. 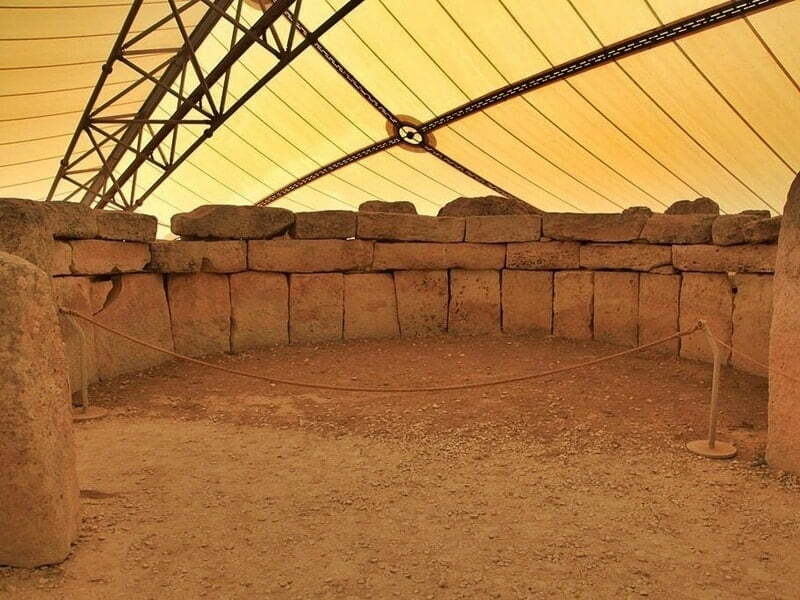 Consequently, for conservation reasons a removable canopy was constructed over the temple complex. 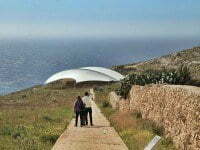 Some visitors feel that the white canopies are an eyesore (see them from above in the Google map below). They are, however, a necessary part of the conservation strategy for these temples, which are now exposed to a harsh coastal climate. They were originally roofed and then buried under soil until 1840. 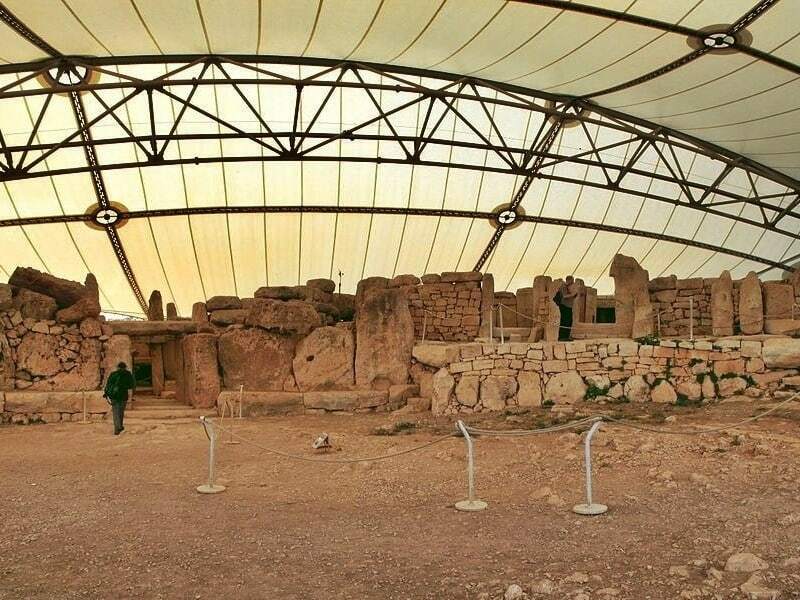 The temples of Mnajdra and Hagar Qim are about 500 metres apart, in the designated Hagar Qim and Mnajdra Archaeological Park. 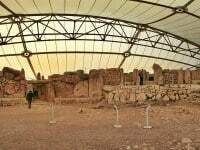 Admission to the park includes entry to the Mnajdra Temples, the Hagar Qim Temples and the Visitor Centre. The facilities are at the entrance to the park, nearer the Hagar Qim Temples. 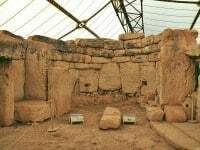 Where are the Mnajdra Temples? The Mnajdra Temples are about five hundred metres along a paved walkway downhill from the Hagar Qim Temples, on Malta’s rugged, southern coastline. Looking for an idea time of the year to visit the temples? 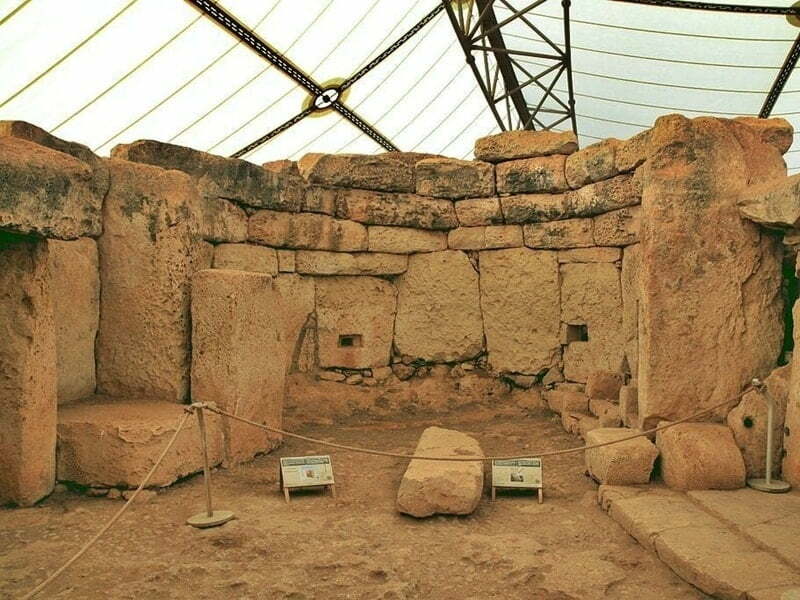 The South Temple at Mnajdra appears to have been constructed to have a specific alignment to the rising sun on the spring and autumn equinoxes as well as the summer and winter solstices. Beyond the main entrance within the South Temple is the doorway to a second pair of apses. On either side of the internal doorway are two large stones the surfaces of which are covered with small, drilled holes. On the morning of the equinoxes, the rising sun shines a beam of light through the main entrance of the South Temple, along its central axis through the internal doorway to the large central ‘altar’ at the rear of the temple. On the morning of the winter and summer solstices, a beam of sun light shines on the pitted blocks of stone to the right and left of the inner doorway, respectively. The path between Mnajdra and Hagar Qim Temple complexes. 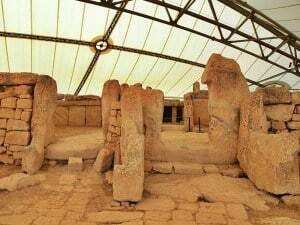 A general view of the south and middle temples at Mnajdra. An apse with niches in the walls of the South Temple. A semi-circular apse of the Middle Temple.